Reasons you can give the younger generation as to why it’s a great field to work in. The manufacturing industry has a considerable employment hole to fill due to a looming skills gap. This is a daily fact we are coping with and are aware of. Here's a look from Shop Floor Automations Inc.
One of the best ways to combat this issue is by putting more emphasis on what a great industry it is for young people to enter. Since the younger generation loves lists, here is a top three list of reasons to give millennials on why manufacturing is a great career choice. 1. Well paying positions. According to the National Tooling & Machining Association (NTMA), those in a manufacturing-related job in America tend to make an average of $15,000 more per year than other job fields. This extra amount of money alone can pay for rent, a new car, or help to significantly pay off school or other related debts, while still having money left over each year. More money for vacations, or saving to get to retirement faster. James Baker, CNC supervisor for Amarillo Gear in Texas, says he first got into machining because the pay would be beneficial for his growing family when he was younger. His appreciation for the field, however, has evolved past paychecks. 2. Flexible work environment with a changing technological and social landscape. Machinist jobs are well known to have a casual dress code, which is usually comprised of thick t-shirts, jeans and hoodies, due to the work environments they expose themselves to. There are also lots of young machinists working today who have tattoos, piercings, and an overall unconventional look, which is completely fine with most manufacturing shop floor employers. 3. Less time in school after high school, and you can often learn the trade during high school! While there is a serious need of resources for STEM learning (science, tech, engineering and math) for youth these days, there are some resources that can be highlighted as great examples. What subjects are the best for young people to get started in, if they want to pursue a manufacturing career? “The machine shop is where you actually use math, trigonometry, and algebra,” Baker says. “I can program, understand and axis machines, and live tool equipment. We have 35k programs online. It’s a big deal." From helping paraplegics walk to delivering increased mobility and load-carrying capacity, exoskeletons find use in medical and every-day use. Throughout the years coverage of exoskeletons in our magazine has been basically on the medical side. First there this article on Vanderbilt’s development of the Indego, now a part of Parker Hannifin. I was lucky enough to get to witness Michael Gore, a T10 paraplegic stand and walk from this technology. Following that we looked at ReWalk’s motorized exoskeleton. Since then, the advancements have come at a rapid pace. Ekso Bionics received an NIH grant for pediatric rehabilitation exoskeleton prototypes; Parker Hannifin furthered its investment in prosthetics by investing in Freedom Innovations; and then there’s the grants to universities for research to continue advancing the technology and applications. Joo H. Kim, an assistant professor of mechanical engineering at the NYU Polytechnic School of Engineering, is addressing those issues and has won a three-year, $539,176 National Robotics Initiative grant from the National Science Foundation to advance his research, which will have particular utility for those with disabilities affecting the lower limbs. Carnegie Mellon University’s Steve Collins and his collaborator Greg Sawicki at North Carolina State University have discovered a way to make humans more efficient at walking. The Wyss Institute for Biologically Inspired Engineering at Harvard University has entered into a collaboration with ReWalk Robotics Ltd., to accelerate the development of the Institute’s lightweight, wearable soft exosuit technologies for assisting people with lower limb disabilities. The Spanish National Research Council (CSIC) introduced the world’s first infant exoskeleton, designed to help children with spinal muscular atrophy, a degenerative illness which affects one in ten thousand babies in Spain. Weighing 12 kilos, the apparatus is made of aluminum and titanium, and is designed to help patients walk, and in some cases for the first time. The technology, patented and licensed jointly by CSIC and its technology-based business unit, Marsi Bionics, is currently in the preclinical phase. So today we can add to that Lockheed Martin. A release from company officials stated that eyeing a new generation of industrial and military exoskeletons, Lockheed Martin has licensed the bionic augmentation technology Dermoskeleton from B-Temia Inc.
Dermoskeleton, the basis for computer-controlled devices that can increase mobility and load-carrying capacity by counteracting overstress on the lower back and legs, and the company's technology license permits use of B-Temia technology to products for military, industrial, commercial, and first-responder applications. "This technology offers a pathway to increased loadbearing and greater agility for our FORTIS industrial exoskeleton," says Glenn Kuller, advanced and special programs vice president at Lockheed Martin Missiles and Fire Control. "It can also help to solve existing limitations of powered exoskeletons for our military and first responders. We're excited about the potential we see here." The FORTIS exoskeleton is an unpowered, lightweight exoskeleton that increases an operator's strength and endurance by transferring the weight of heavy loads from the operator's body directly to the ground. This is done through a series of joints at the hips, knees and ankles. This originated from Lockheed Martin's exoskeleton research to assist soldiers in carrying heavy equipment across long distances The same principles were applied to exoskeleton development for use in industrial settings. Technology continues to amaze and advance at a quick pace. 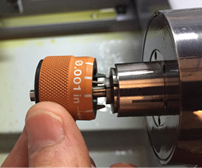 Frustrated with the limitations of conventional collets and workholding systems when performing secondary machining operations, a solution became a high-precision, collet-type workholding device for small parts machining. Win a welder for a school, yourself during ESAB's national welding month celebration. April is National Welding Month, and to celebrate all of the hard-working welders and welders-in-training, ESAB Welding and Cutting will award one lucky person a Rebel EMP 235ic multiprocess welder and a SENTINEL A50 auto-darkening helmet as part of its National Welding Month contest. Entries will be accepted online from April 1 to 30; to enter visit ESAB.com/welditforward. To pay it forward, the contest winner can nominate the school of their choice, and ESAB will award the school a Rebel 215 or Rebel 235, a welding cart and 10 SENTINEL welding helmets. The approximate retail value of the school award is $3,599, while the value of the individual prize is $2,899. In addition to the grand prize drawn at the end of the month, ESAB is offering weekly opportunities to win swag. Visit ESAB’s Facebook page each Wednesday during April and participate in the company’s welding trivia contest. Trivia content and grand prize winners will be announced on ESAB’s Facebook page. At 53 lbs. and with a 235-amp rated output at 40% duty cycle (maximum output is 250 amps/30 volts), Rebel 235 has the best power-to-weight ratio in its category. Its portability benefits users who need maximum flexibility when moving a welding machine around the shop or working in the field. For further flexibility, Rebel 235 automatically detects the correct single-phase input power from 90 to 270V. Rebel 235 comes wired with a 230V plug; users simply need to attach the supplied power adapter to connect to 120V power. Rebel 235 holds 4-, 8- or 12-in. wire spools, features dual gas ports with solenoid valves and has optional single- and dual-cylinder carts, remote amperage controls and spool guns for MIG aluminum. 10 minutes to sell an idea, excite an audience, win supporters, perhaps realize a life’s dream – that’s Startup Pitch @ Young Tech Enterprises. Following the 2016 premiere, HANNOVER MESSE and the German Startups Association are partnering to stage the competition Startup Pitch @ Young Tech Enterprises from April 24-28, 2017. Forty young companies compete for prize money, potential investors, customers, partners, and media coverage. Each competitor has 10 mins. to present their concept. The condition: impress with products and solutions relevant to HANNOVER MESSE – from industrial automation, power transmission, fluid technology, and energy to compressed air and vacuum technology, industrial supply, and research. Pitches take place daily at the Young Tech Enterprises stage in Hall 3. A panel of experts will select the winner. Constantia New Business provides prize money of 1,000 euros. “We are enhancing HANNOVER MESSE with the Startup Pitch at Young Tech Enterprises. Established companies and investors meet tomorrow’s market leaders in a short period of time. We invite them to cooperate and work together to build new businesses,” says Sascha Schubert, co-chairman of the German Startups Association. Applications for the Startup Pitch @ Young Tech Enterprises can be submitted at www.f6s.com/startuppitchyoungtechenterprises2017. The deadline is April 2, 2017. Young Tech Enterprises in Hall 3 is the hub of startup activity at HANNOVER MESSE. Founders and young companies meet startup networks, accelerators, and economic development organizations as well as large companies and investors. The program features an exhibition area as well as a forum, pitching and matchmaking events, and workshops. Participants also profit from access to the thousands of exhibitors at HANNOVER MESSE. Young Tech Enterprises showcases 150 companies on a display area of 1,600m2 in 2017.